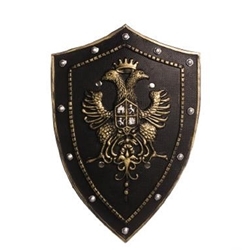 The Coat of Arms Shield is a soft, flexible black and gold medieval era shield measuring 22” x 15”. This shield features a central coat of arms design of two winged creatures standing back to back, with a crown above them. Pair with a Medieval Knight Sword and Chain Mail for a robust knight costume, great for Halloween, a Renaissance Faire, or theatrical event!